A mock Mars mission that locked six volunteers inside a simulated spaceship for more than 500 days seriously disrupted the crew's sleep patterns and waking behavior. The disruptions could have led to atrophy of muscle and bone had the crew been on an actual spacecraft, scientists say. These new findings, based on a study of an unprecedented 520-day Mars simulation, could help reveal ways to keep astronauts healthy and working in sync on any future deep-space missions, researchers added. 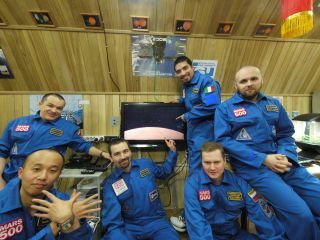 The Mars500 mission locked six multi-national volunteers on a mock spaceship bound for Mars in Moscow. The $15-million experiment mimicked a mission to Mars to help researchers better understand and perhaps ease the psychological and physiological stresses such a long space journey would impose on astronauts. The crew "returned" to Earth in 2011. To learn more about what each crew member experienced, Dinges and his colleagues had each volunteer wear wrist devices that recorded movement and surrounding light intensity to deduce activity levels, sleeping and waking dynamics, and the amount of light exposure the volunteers received. The wrist devices recorded data every minute of the Mars500 crew's 17-month stay, resulting in nearly 4.4 million minutes of data. The researchers also had the crew take computerized vigilance and reaction-time tests twice weekly, and quizzed the volunteers about their workloads, tiredness, and sleep quantity and quality. The scientists found that the crew unconsciously and progressively decreased overall movement during the mission, entering what the researchers called "behavioral torpor." "The reason this matters is because, in the microgravity found in space, which we didn't simulate, if you're not active, you can suffer loss of bone and muscle, and decondition your cardiovascular muscle very severely, making it difficult to complete missions," Dinges told SPACE.com. "This shows we've got to find ways to keep crew physiologically active." A volunteer in the Mars500 mock Mars mission performing a test of reaction time during the 520-day endurance simulation. The increased sleep in itself was not a bad thing. The more sleep the crew got, the better they scored on the vigilance tests, as one might expect, said lead study author Mathias Basner, a sleep researcher at the University of Pennsylvania in Philadelphia. However, four of the six crew members experienced some disturbances in their normal sleep behavior that occurred early in the mission and persisted throughout. Some experienced less sleep or poorer quality sleep, with resulting problems in performance. Others' patterns of sleeping and waking, their circadian rhythms, grew greatly out of sync with the other volunteers. These problems, similar to disturbances in sleeping and waking seen in polar expeditions, "are potentially dangerous for mission success," Basner said. The strong differences seen among different crew members "highlights the need to identify markers of differential vulnerability, so that we will be able to select the right crew, train them optimally and provide them with individualized countermeasures during long-duration spaceflight," Basner told SPACE.com. Future research may tinker with the color, intensity and timing of lighting, which is the most potent way to influence circadian cycles, Dinges said. For instance, the fluorescent lights used in the habitat give off less blue light than does natural light from the sky. Experimenting with the timing of dining and exercise might also help crew maintain their circadian rhythms. "We have to take the cues of Earth with us when we go to Mars," Dinges said. In addition, "monotony, especially during periods transitioning to and from Mars, needs to be avoided, to keep crew members active while awake," Basner said. "As long as the International Space Station is available as a test bed, we should use it to investigate how humans react to prolonged periods of confinement and isolation in microgravity," Basner added. The National Space Biomedical Research Institute plans to work with NASA and the Russian Academy of Sciences' Institute for Bio-Medical Problems to study one American astronaut and one Russian cosmonaut for a one-year period on the station, he noted. The scientists detailed their findings online Jan. 7 in the journal the Proceedings of the National Academy of Sciences.